Speaking & Training | E Sue Huff & Associates Inc.
Sue Huff, a native of Southwest Virginia, is the owner and president of E. Sue Huff & Associates, Inc. Marketing and Management Consulting. The firm is based in Naples, Florida and has earned the highest reputation for their honest and down-to-earth business approach. Sue’s extensive business background in the printing industry, along with her entrepreneurial experience, led to the development of her consulting firm in 1996. E. Sue Huff & Associates, Inc. helps clients develop, administer and plan their marketing strategies as well as provide gap management and other management services for those companies who find themselves with too few senior managers to complete projects. Our associates can speak on a variety of business topics and we can customize a lecture, speech or training session using your topic of choice. 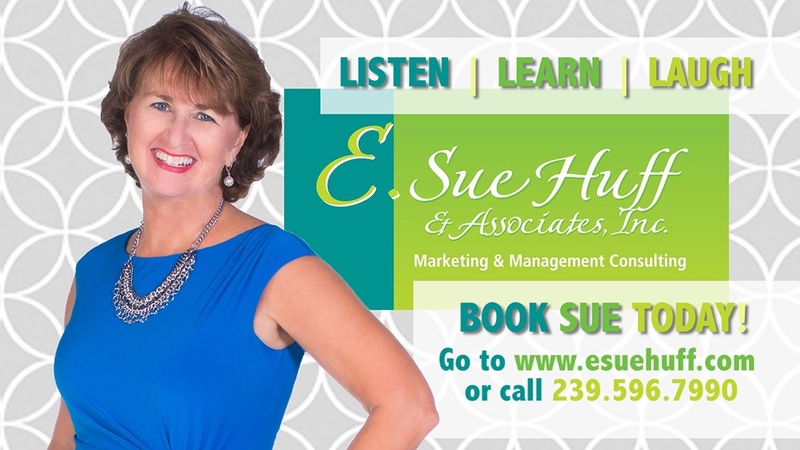 E. Sue Huff & Associates, Inc. can help you with many areas of training for your business, whether it is marketing or management issues and topics. We can assist your staff to see the big picture or the minute details more clearly. Sue has been delivering fun, fast paced seminars and speeches for many years. Her theatre and radio background give her a different dimension. Her audience participation helps attendees to retain and remember information that is helpful and practical, information and tips that they can immediately use.